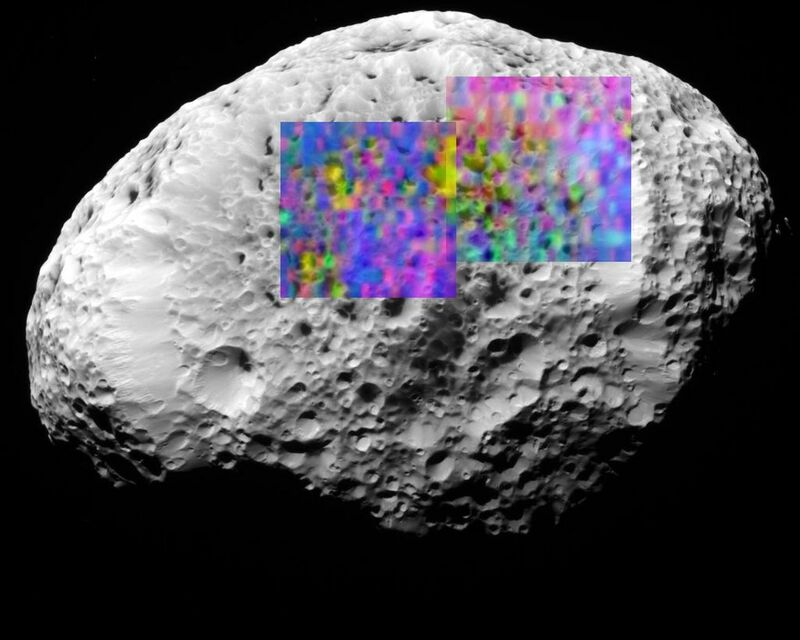 Hyperion, the eighth largest of Saturn's nearly 60 known moons, is covered in craters and landslides. Sprinkled over the icy surface is a thin layer of organic dust, which has somehow been concentrated in the bottoms of some of the craters, forming a reddish black deposit. 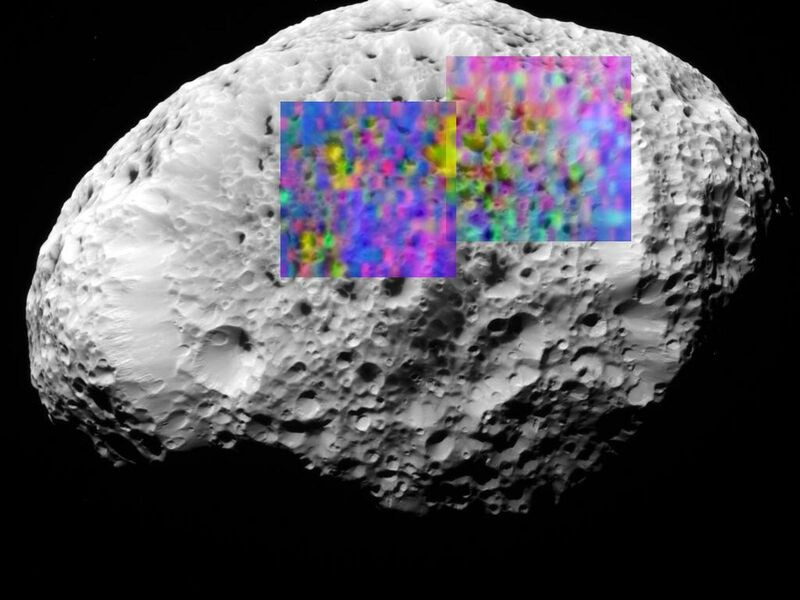 This new color map shows the composition of a portion of Hyperion's surface determined with the Visual and Infrared Mapping Spectrometer aboard the Cassini spacecraft. 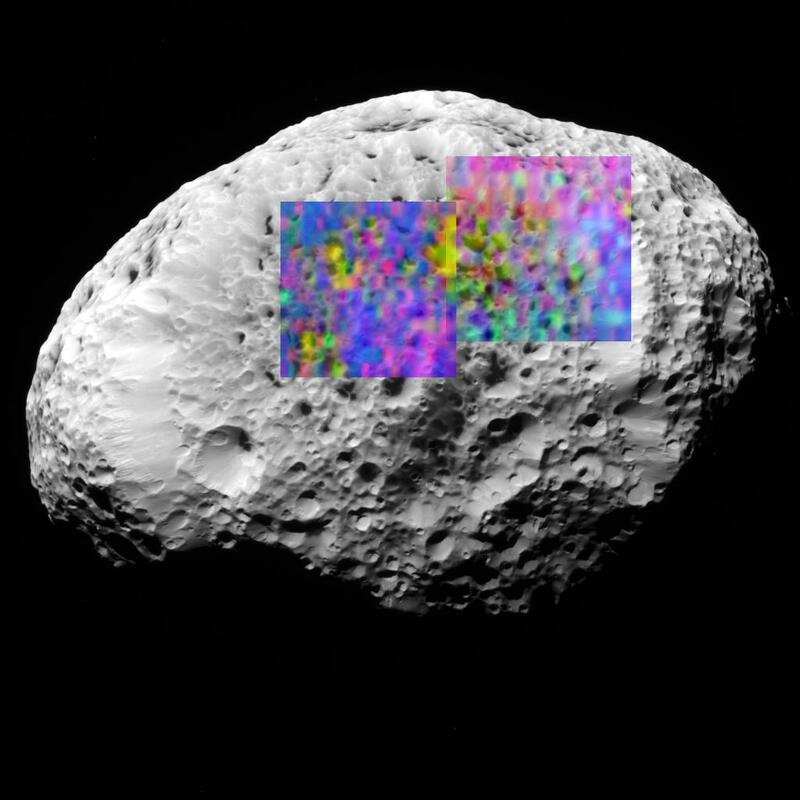 The new composition map is overlaid onto a previously released Cassini image of Hyperion, taken with the Imaging Science Subsystem (see PIA07761). Blue shows the maximum exposure of frozen water, red denotes carbon dioxide ice ("dry ice"), magenta indicates regions of water plus carbon dioxide, yellow is a mix of carbon dioxide and an unidentified material. 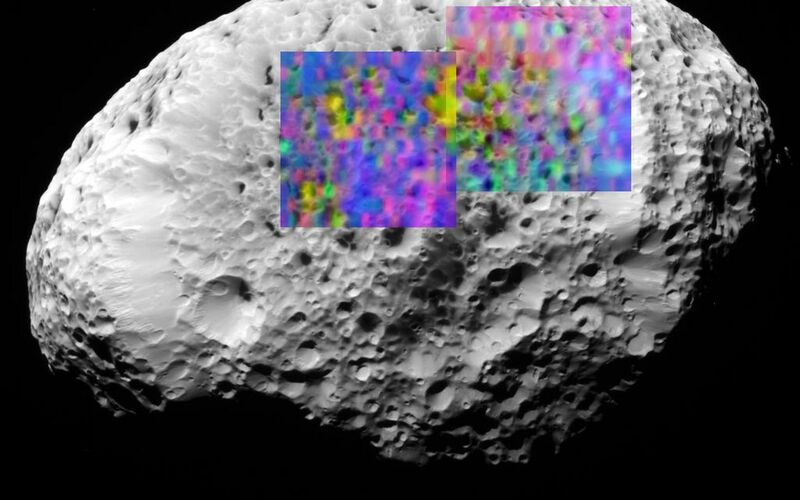 Discovered in 1848, Hyperion held its secrets until the Cassini spacecraft flew close in September 2005, revealing its icy and organic composition. Hyperion is irregular in shape, tumbles chaotically, and takes 21 days to orbit Saturn. It is 300 kilometers (180 miles) in its longest dimension. The Cassini-Huygens mission is a cooperative project of NASA, the European Space Agency and the Italian Space Agency. The Jet Propulsion Laboratory, a division of the California Institute of Technology in Pasadena, manages the mission for NASA's Science Mission Directorate, Washington, D.C. The Cassini orbiter was designed, developed and assembled at JPL. The Visual and Infrared Mapping Spectrometer team is based at the University of Arizona. The imaging operations center is based at the Space Science Institute in Boulder, Colo.
For more information about the Cassini-Huygens mission, visit: http://saturn.jpl.nasa.gov/home/index.cfm. The visual and infrared mapping spectrometer team home page is at: http://wwwvims.lpl.arizona.edu. The Cassini imaging team homepage is at http://ciclops.org.